Here's a comp I did for Telltale's Sam & Max Season 2. We didn't choose it but I thought without the text it might make a fun print to do in the near future. As far as hyper-over-stated detail it seems to show some potential that hasn't nearly been tapped in this sketch. I think it'd be a great print. It would obviously make a great print, but I kind of like it as is, all lively, sketchy, and artifacty. Awesome, I love Sam and Max in any diner or roadside attraction. Feels like home. It's a "Heck yes!" from me! Hey, you know what you should do? You should go to Heroes Con. Looks great... Sam & Max is well-known as a video game in France, why not a french translation of the comic book ? I'll buy it if you print it. Speaking of which - Are you gonna be at SDCC this year? I'll be at Comic Con at least a day. I'll let folks know when I know. I definitely vote for a print. I think it would look really cool the way it is with just a little color. 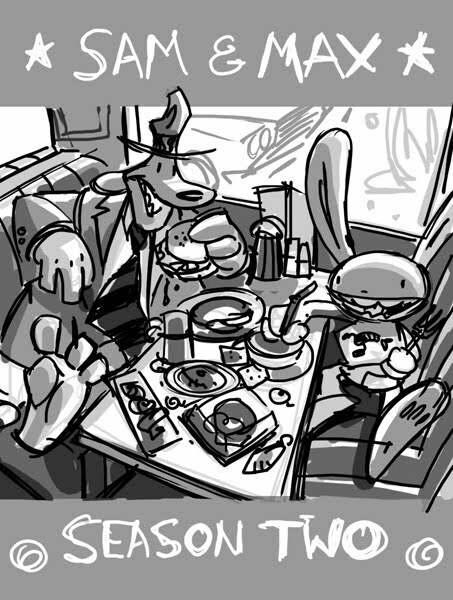 I totally agree with Sean Lane as well, Sam & Max on the road in a diner is a perfect match!